Totem was born out of a belief that stories and seeds are precious commodities that bind us together, and that through recording and preserving them, we help to create a rich and cohesive society. Stories are how we bond as humans. Seeds are our heritage in cultivating the earth sustainably. 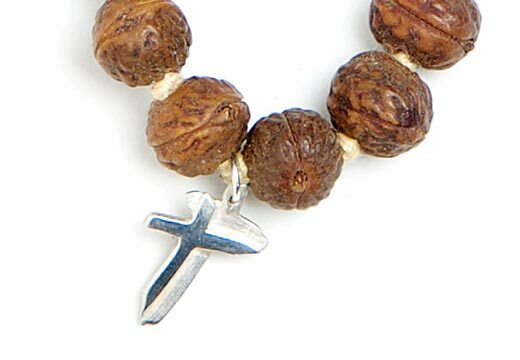 This jewellery combines both of those elements in a spirit of gratitude. Totem wants to challenge society’s accepted perceptions about what is truly valuable to us, by re-evaluating our relationship to our personal stories and to our indigenous seeds. Our stories define, inspire and connect us to one another. Certain stories have the power to heal. Our seeds, which are considered sacred in many societies, are becoming less and less available in their unprocessed natural form to the general public. With the endangering of our native seeds and the loss of many of our important stories, Totem combines the love of story and the love of our seed inheritance to highlight the interconnectedness of each of us. Totem views stories and seeds as deep nourishment. As such, we seek to preserve stories and seeds as a legacy for subsequent generations, and as a truly personal gift to someone special. We have created three lines of necklaces made from sacred seeds and recycled silver to both symbolise and fund the expansion of this vision. 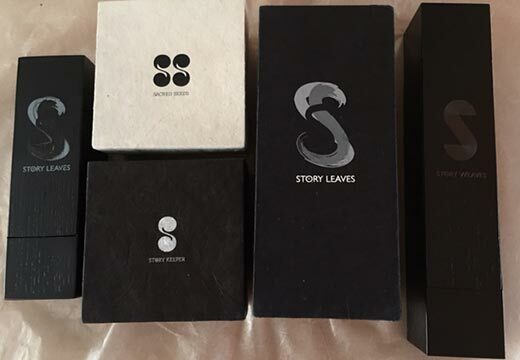 Choose from our SACRED SEEDS, STORY KEEPER or STORY LEAVES and share a personal message of love with someone special. Totem pledges 10% of the profits from every sale we make into our Totem Foundation Fund and Totem Phoenix Tales. Totem is proud to work with The Lions Barber Collective (registered Charity 1176363) who aim to raise awareness for Mens Mental health, suicide prevention and depression. Suicide is the biggest killer in young people and nearly 80% of these suicides are men. Making stories accessible means people can understand that they are not alone in their feelings and emotions. The most commonly cited issue is the feeling that no one else feels this way . This leads to shutting down, alienation and further separating from the world. Barbers have a unique opportunity to help their clients, due to the strong and personal bond created while in the barber chair. It is common for clients to open up without having to prompt them, is is on this basis that TLBC have worked with many professional psychiatrists and the NHS to produce Barber Talk training to educate barbers on how to recognise the signs of depression and mental health issues so they can then sign post their clients to the right organisations like Papyrus, Calm, Hub of Hope and Samaritans. Totem Phoenix Tales is the active arm of Totem Foundation Fund, producing videos of real life tales of survival and life enhancement. These Totem Phoenix Tales tell the stories of how people went from their lowest ebb to flourishing in their lives. We also give healthy lifestyle and dietary suggestions to help sustain good mental health. Each necklace and all our packaging is created using recycled and sustainable materials; sacred seeds are from a family owned sustainable organic orchard in Indonesia, recycled 925 silver, handmade paper boxes from sustainable plants in the Himalayas, wooden boxes from a family owned UK business, made from renewable forests. Each necklace is blessed upon completion and then they are all blessed by the High Priest in Bali before being sent to London. All silver links and adornments are created in London by multi award winning traditional Master wax casters and jewellers. Our mobile pop up shop the Totem Story Park is also completely constructed here in London from recycled materials, leaves from the poppy drop, reclaimed wood, plastic bottles, recycled paper and books. The pop up shop was created by the set designer for Dr. Who and created entirely in London. 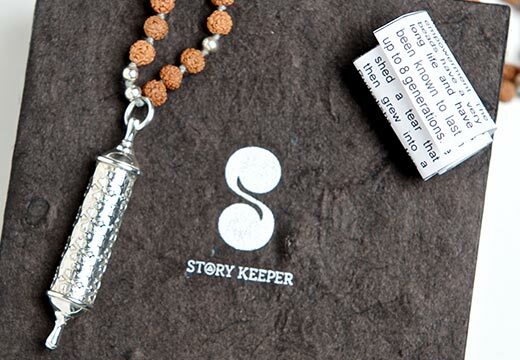 The Story Keeper holds within it a miniature waterproof paper scroll inscribed with a story personal to the recipient. 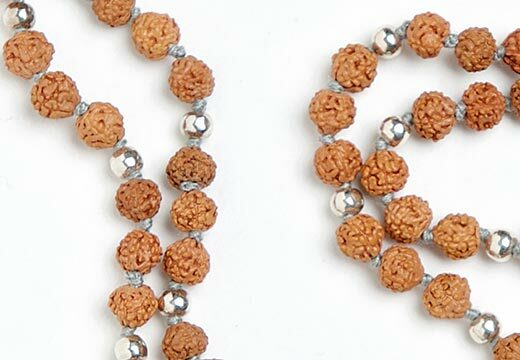 Our Totems are made using Rudraksha seeds which are grown on a locally owned, organic, sustainable plantation in Bali. Each Sacred Seed necklace is tagged with a recycled silver ‘T’ hallmarked in London.